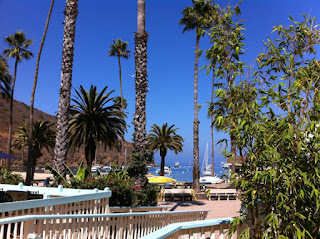 Much to my delight I was invited to be a part of the annual Las Caballeras expedition to Santa Catalina Island. 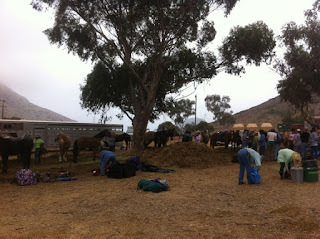 65 equestrienne women loaded up their animals in Palos Verdes Estates and sent them off across the channel to arrive at a staging area and await us. 64 horses and mighty Tobe, we had a big responsibility being the only mule team! 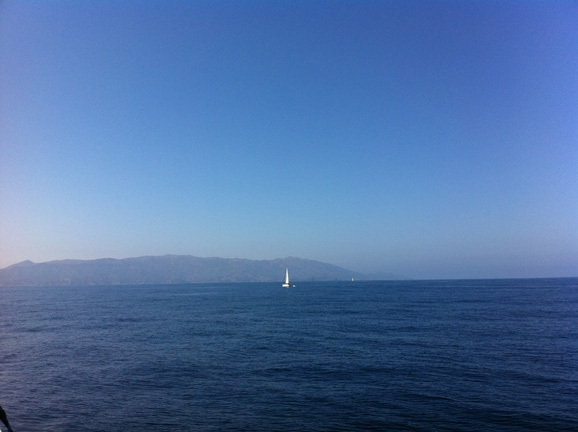 This is a slight departure from the previous format of the blog, because I didn't map the 22 mile sea voyage. No ears to look through. 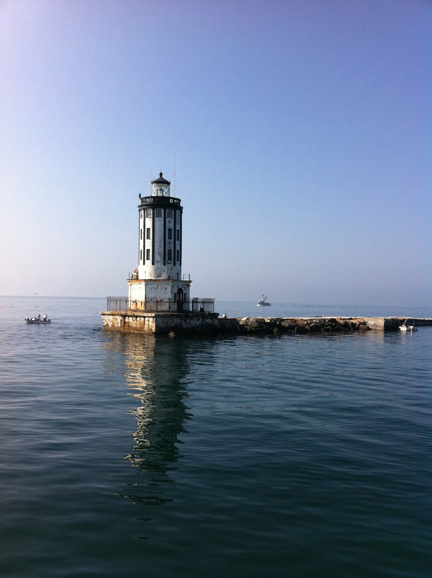 Angel's Gate lighthouse in the entrance to the San Pedro harbor. We gals all loaded up on a small charter boat and started to get acquainted and began our big adventure. 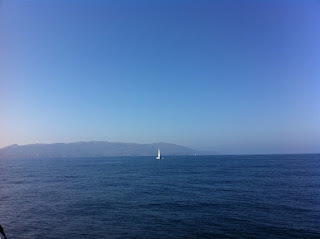 Land ho! 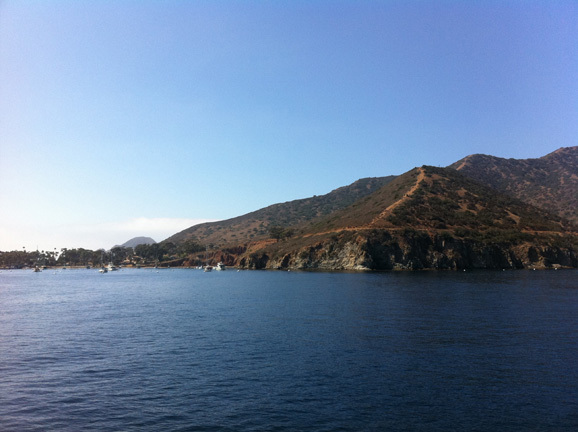 It was an very overcast day, so when Catalina appeared through the marine layer it was quite mysterious. What WOULD this vacation be like? The beautiful Twin Harbors at the isthmus began to take shape. And there, safe and sound, was my fabulous mule. Cool calm and collected on a highline, under a eucalyptus tree, waiting for me to tell him where we were going next. All the animals had come over much earlier, so by the time the girls arrived they were standing around like the ocean voyage had been nothing to them. 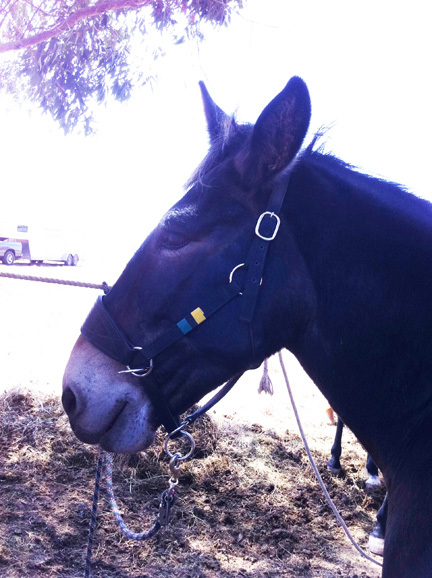 Tobe was between a big manure pile and the eucalyptus, and had plenty to eat and no crabby horses to kick him, so he was quite relaxed. So after fussing over our creatures and reassuring ourselves that they were none the worse for wear, we headed back to the harbor where I ate the first of several bison burgers and waited for the island bus that was to take us to our campsite on the ocean side of the island. 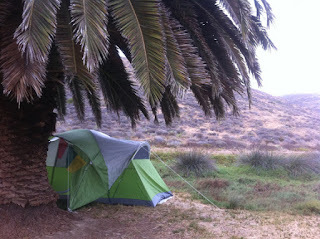 And here is my tent, set up under a palm tree, in Little Harbor. Tibetan prayer flags strung, gear spread out inside, ready for a gourmet meal and a good night's sleep and onward to cowgirl adventures in the next week.